The License Wizard example shows how to implement linear wizards using QWizard. Most wizards have a linear structure, with page 1 followed by page 2 and so on until the last page. Some wizards are more complex in that they allow different traversal paths based on the information provided by the user. The License Wizard example shows how to create such wizards. 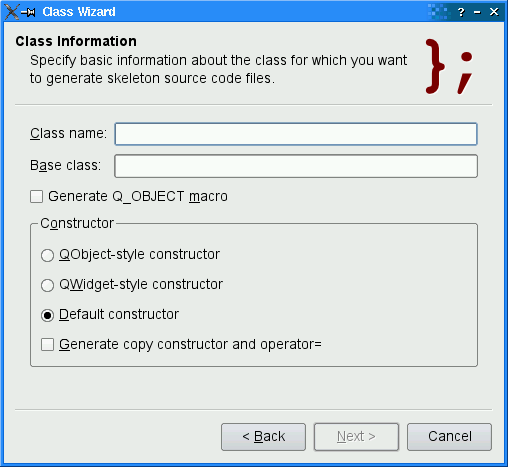 ClassWizard inherits QWizard and provides a three-step wizard that generates the skeleton of a C++ class based on the user's input. IntroPage, ClassInfoPage, CodeStylePage, OutputFilesPage, and ConclusionPage are QWizardPage subclasses that implement the wizard pages. The first page is an introduction page, telling the user what the wizard is going to do. The second page asks for a class name and a base class, and allows the user to specify whether the class should have a Q_OBJECT macro and what constructors it should provide. 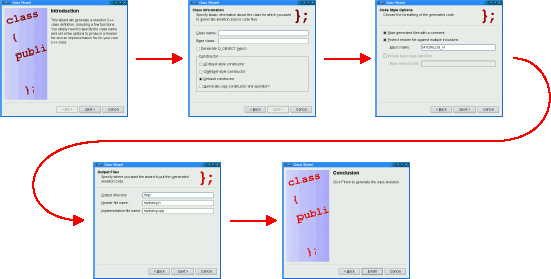 The third page allows the user to set some options related to the code style, such as the macro used to protect the header file from multiple inclusion (e.g., MYDIALOG_H). The fourth page allows the user to specify the names of the output files. The fifth page is a conclusion page. Although the program is just an example, if you press Finish (Done on Mac OS X), actual C++ source files will actually be generated. The class reimplements QDialog's accept() slot. This slot is called when the user clicks Finish. We instantiate the five pages and insert them into the wizard using QWizard::addPage(). The order in which they are inserted is also the order in which they will be shown later on. If the user clicks Finish, we extract the information from the various pages using QWizard::field() and generate the files. The code is long and tedious (and has barely anything to do with noble art of designing wizards), so most of it is skipped here. See the actual example in the Qt distribution for the details if you're curious. label = new QLabel(tr("This wizard will generate a skeleton C++ class "
"definition, including a few functions. You simply "
"need to specify the class name and set a few "
"options to produce a header file and an "
Then we create a QLabel and add it to a layout. setSubTitle(tr("Specify basic information about the class for which you "
First, we set the page's title, subTitle, and logo pixmap. The logo pixmap is displayed in the page's header in ClassicStyle and ModernStyle. Then we create the child widgets, create wizard fields associated with them, and put them into layouts. The className field is created with an asterisk (*) next to its name. This makes it a mandatory field, that is, a field that must be filled before the user can press the Next button (Continue on Mac OS X). The fields' values can be accessed from any other page using QWizardPage::field(), or from the wizard code using QWizard::field(). commentCheckBox = new QCheckBox(tr("&Start generated files with a "
The code in the constructor is very similar to what we did for ClassInfoPage, so we skipped most of it. The initializePage() function is what makes this class interesting. It is reimplemented from QWizardPage and is used to initialize some of the page's fields with values from the previous page (namely, className and baseClass). For example, if the class name on page 2 is SuperDuperWidget, the default macro name on page 3 is SUPERDUPERWIDGET_H. The OutputFilesPage and ConclusionPage classes are very similar to CodeStylePage, so we won't review them here. See also QWizard, License Wizard Example, and Trivial Wizard Example.